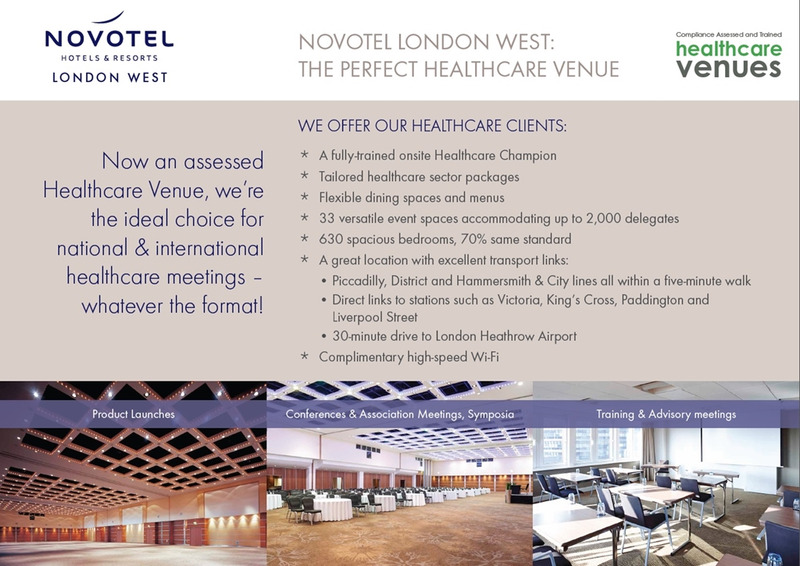 Healthcare Venues believes the Novotel London West aligns to the metric applied to our GREEN assessment status. 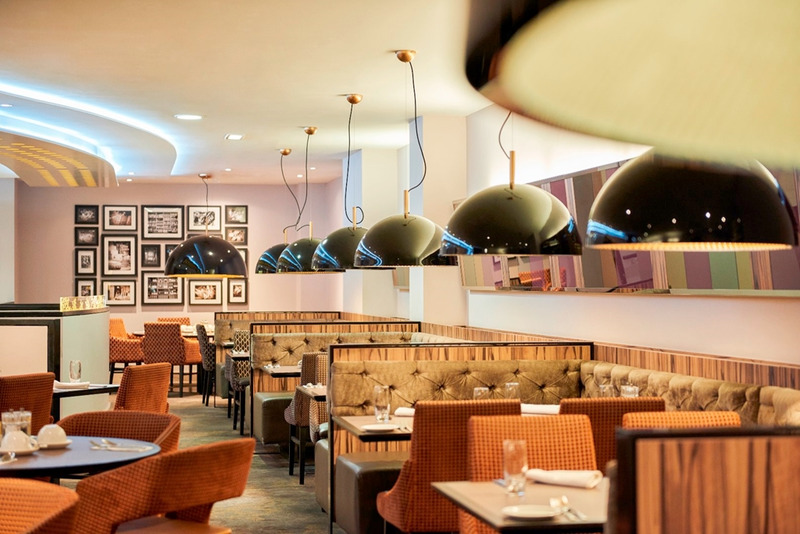 The Novotel London West is a 4-star business hotel, located in Hammersmith, to the west of the city, and 20 minutes by underground from the city’s West End. The hotel is surrounded by residential streets, offices, a major bus station, shops, a popular concert venue and the head offices of some of the world’s largest brands. Within a three-minute walk is Hammersmith underground station which provides access to three tube lines including the Piccadilly line with direct access, within 25 minutes, to London’s Heathrow airport. 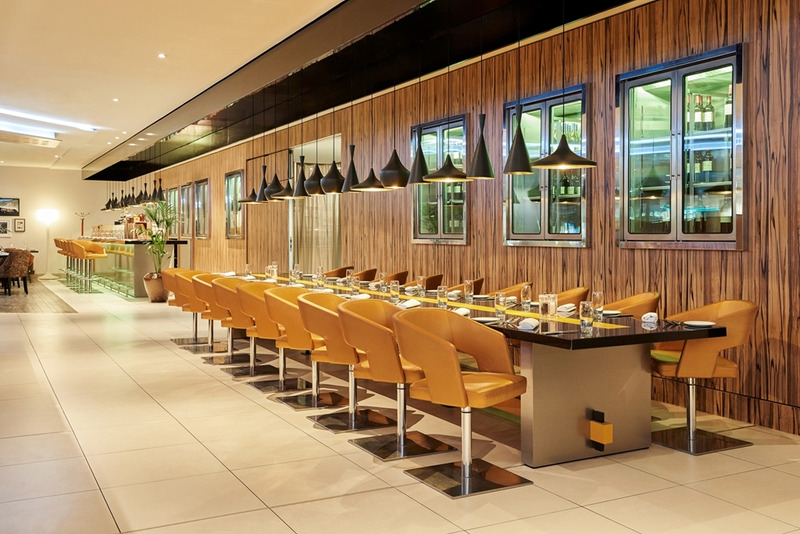 The Novotel London West is a 4-star business hotel, located in Hammersmith, to the west of the city, and 20 minutes by underground from the city’s West End. The hotel is surrounded by residential streets, offices, a major bus station, shops, a popular concert venue and the head offices of some of the world’s largest brands. Within a three-minute walk is Hammersmith underground station which provides access to three tube lines including the Piccadilly line with direct access, within 25 minutes, to London’s Heathrow airport. The airport can also be reached by the A4 main road which runs alongside the hotel and feeds into the M4 motorway and then the M25 London Orbital serving the UKs motorway networks. The hotels positioning as a business hotel, location, transport access, flexible and numerous meetings spaces in our opinion, offers an excellent venue for national and international healthcare meetings from small advisory boards of 10 – 20 to larger exhibitions in the ground floor Chablis Suite, and in the largest meeting room, the Champagne Suite which is suitable for conferences and association meetings of 540 persons in a classroom setting with adjacent rooms and spaces ideal for registration, breakout, catering and networking areas. The hotel is a preferred venue for many well-known healthcare companies and their can be found within 30 minutes, consequently the venue has strong experience of holding public and private sector healthcare events. 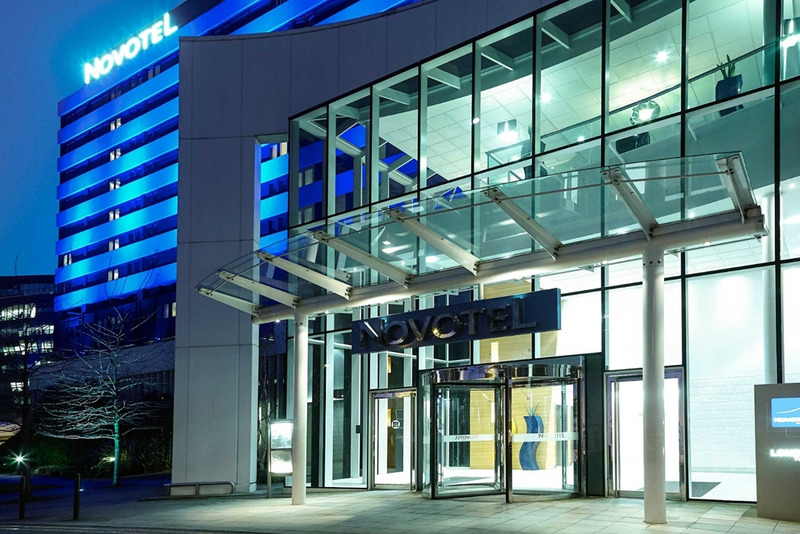 The Novotel London West is labelled as a Novotel Hotels and Resorts property, but is positioned as a business, not a resort under the Accor hotel group brand which describes the hotel as “mid-scale suitable for business or family trips”. The hotels own homepage does advertise the potential for city breaks with imagery of iconic sites of London, but they cannot be found directly outside the hotel. This does suggest a more leisure focus to the marketing for guests wanting to use the hotel as a holiday base, but this should not detract from the compelling meeting capabilities of the hotel. Links from the homepage bring you to the pages on Conferences & Events and Meetings & Training with descriptions and details of 33 flexible and adaptable meetings and events spaces available across four dedicated meeting floors. Details about the public areas, such as the two restaurants and fitness areas, are not core to the sales offering and therefore not prominent and can only be found via the Menu drop down. The hotel has two restaurants located on the first floor. The Aroma Restaurant is the main location for breakfast, buffet lunches and dinner, and can accommodate 175 guests. The adjacent Artisan Grill is a small 46-person restaurant, which has previously been advertised as an Award-Winning Restaurant. External travel sites support the hotels 4-star rating and focus on the hotels location - the overall meeting offering is unlikely, in our opinion, to raise any compliance concerns for any risk adverse company or association that might conflict with the sector understanding of an appropriate venue. The hotel has Twitter and Facebook pages which typically provide images and comments relating to leisure events held at the venue. They do manage a LinkedIn page which is more business focussed and the main focus via this channel is on the business aspects of the property. The hotel is ideally located in Hammersmith which is to the west of London’s city centre and 20 minutes by underground from the city’s West End. Heathrow Airport can be reached in 25 minutes either by direct tube from the nearby Hammersmith tube station or by car using the adjacent A4 which feeds in to the M4 motorway. The tube station is a short walk away and is serviced by the Piccadilly, Hammersmith and City lines, which provides access to many central parts of London including major rail stations such as Paddington, Kings Cross, St. Pancras and Marylebone all in less than 30 minutes. The underground hotel car park provides car spaces for 240 and 6 coach bays, but it is also used by rental car company Sixt. Parking cannot be guaranteed and is not normally included in DDR / 24-hour rates. The current rates are £3.50 per hour non-resident £1.50 and per hour for hotel residents. This area of London is mostly residential and is supported by many world-renowned hospitals, and the UK National Healthcare Service regularly hosts meetings at the hotel. The Novotel London West is a concrete and brick building and was originally purpose built in 1972 as a hotel with simple architecture that is not ornate or over-elaborate. The hotel website suggests it can be used as a base from where guests can undertake more leisure-based activities, but the leisure options at the hotel are minimal and can be considered as proportionate to the overall venue and not central to its offering. The 33 meeting spaces are found across the Ground Floor, Mezzanine, First and Second floors and located above each other with access via lifts or elevators so more privatised areas can be organised for the more security conscious clients. The venue has experience of holding public and private sector healthcare events and is a preferred venue for many well-known healthcare companies. The hotels main reception is located on the first floor and provides numerous check-in desks and a spacious lobby. There is no concierge, but a virtual touch screen concierge provides guests with information that can assist in providing guests with information. There is a piano positioned to the side of the lobby and is available for guests to play. More accomplished players may create an audience, but the hotel does not book pianists to perform for guests. Meetings: All 33 meeting rooms are named after French wines and can be found on four dedicated floors accessible by lift, stairs and elevator. For example, in the case of the Champagne Suite, the name is of a French wine and not intended to suggest anything celebratory and can be considered a function room not a lavish ballroom. There is no theming to reflect the names of the rooms. With all meeting space located above each, delegates have easy access between floors and rooms – ideal for healthcare companies looking for meeting space that provides meeting space away from the public gaze. Elevators lead from the ground floor directly to the Mezzanine Floor where 6 rooms can accommodate meetings for between 14 – 100 delegates in classroom style. With just meeting rooms on this floor this would be a strong option for healthcare meetings that require secluded meeting space. The First floor is where you can find the Champagne Suite, the largest of the meeting spaces. Access is gained for delegates staying in the hotel via the hotel lobby but there is also a dedicated meeting space entrance for day delegates. Both entrances lead into the Black/White reception area where escalators provide access to the Mezzanine meeting rooms, ideal if they are to be used for breakouts/workshop rooms. From a central Foyer the larger Cremant room to the left can accommodate 540 in classroom style or 520 cabaret style. The Mancy, Avize and Morangis rooms make up the Cremant and offer 180 classroom in three even sections without natural daylight. To the right it the Champagne Terrace which can accommodate 480 in theatre style. With its ability to be made private and its 6m ceiling height, the Champagne Suite would provide an ideal space for larger exhibitions, association congresses or investigator meetings with the Champagne Terrace rooms offering privatised spaces for catering or breakouts with the foyer for registration and tea/coffee breaks. The Champagne Terrace can be split into four sections, each of which can accommodate up to 120 persons theatre style. Also, on the first floor are the Cognac and Bourgogne rooms and they provide an excellent option for a more privatised meeting such as a Sales Force Meeting for 120 theatre or dinner meeting where dinner is to be taken in an adjacent room. The Bourgogne is located next to the kitchens and can accommodate 160 for a sit-down dinner. The second-floor meeting rooms are accessed by lifts from all floors and offers 17 rooms, all with natural daylight, providing spaces of various size from 8 – 100 in classroom style. This includes one executive boardroom and two Eureka rooms which incorporate break areas within the room that can be curtained off. The Day Delegate rates include standard items such as main meeting room hire, audio visual equipment, 3 tea/coffee breaks pads/pens, water and buffet lunch i.e. Nothing that would give the impression that the service levels are above that required from a healthcare meeting. The decoration of all meeting rooms is a mix of warm animal patterned brown carpets and light-coloured walls; the light fittings are functional rather than decorative and black chairs and light-coloured tables support but not of a level that would suggest anything luxurious. 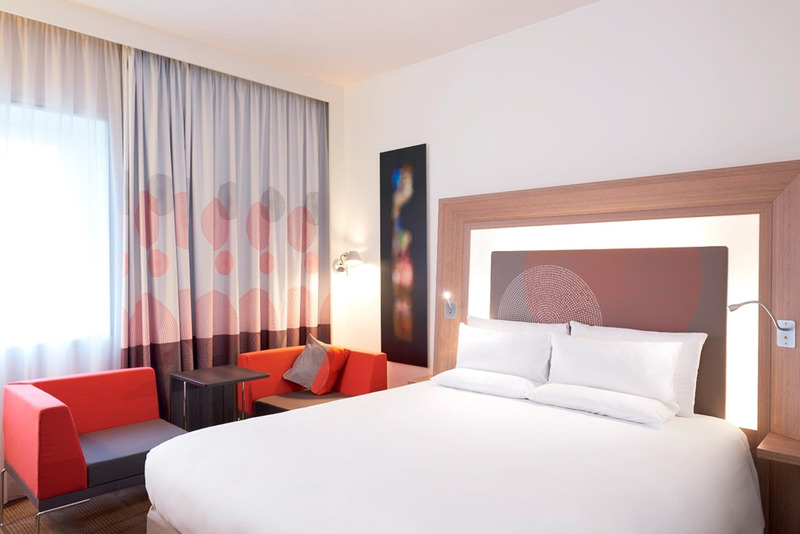 Bedrooms: The Novotel London West has 630 bedrooms in total, spread across 7 dedicated floors, from the 3rd to 9th floor. Due to the hotel’s location surrounded by office and residential buildings, higher floors would not determine a better view and therefore, would not be considered an upgrade. There is no Executive Lounge. Superior Rooms are the hotels Standard bedroom offering and there are 486 rooms of which 377 are doubles and 109 are twins. Rooms come with working area, flat screen TV with Freeview, fair trade toiletries, hairdryer, iron and ironing board, laptop safe, tea/coffee making facilities and fridge. There next category is the Executive rooms of which there are 65 including an extra iPhone speaker, bathrobe, Nespresso machine and complimentary water. There are 75 Premium Executive rooms which have separate showers and a Bose wireless speaker. All rooms other than the 4 suites are the same size, with only the amenities that are different. All rooms are simply decorated using light brown furniture and carpet with light walls creating a modern and contemporary feel. Art work in the rooms is not consistent but is not used to create a gallery feel. Bathrooms are consistent in size across the Superior and Executive levels with light décor across all room types with walk in showers, toilet basin unit and own brand toiletries. Novotel hotels bathroom product is consistent across the group and would likely be considered functional rather than luxury. Restaurants: The AROMA is the main hotel restaurant serving buffet breakfast, lunch and dinner. Located off the lobby on the first floor this contemporary cream and dark brown space can seat 175 in a mix of table and booth sizes. With no walls or partitions, it offers no private areas or rooms and although tables can be reserved, they would not be suitable or appropriate for dinner meetings where privacy is required. Delegates attending smaller meetings tend to have reserved tables for a more informal lunch in this public space. The Aroma is very much a central point of the hotel due to its position and size. For private breakfasts, lunches or dinner meetings of up to 160, the Bourgogne meeting room is located behind the Aroma Restaurant and can only be accesses via the restaurant or via the Cognac meeting room. 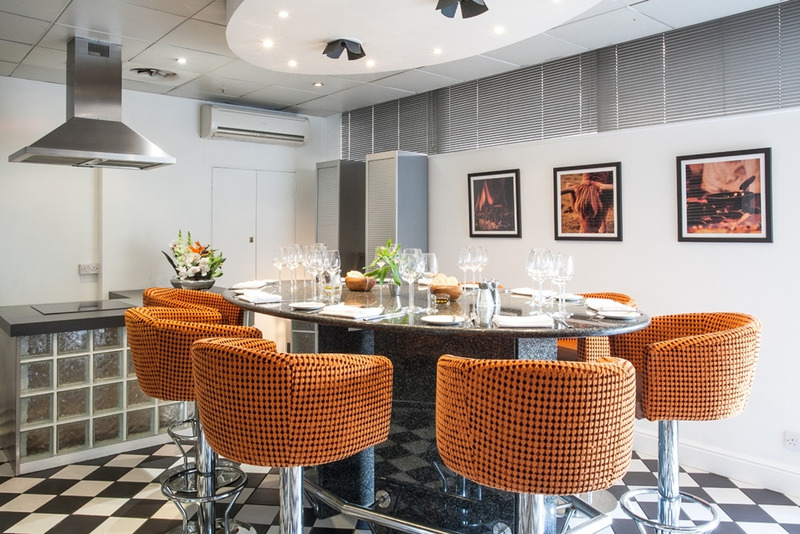 The Cognac meeting room can accommodate 72 cabaret / 120 theatre style so with the Bourgogne for catering this would be ideal for a more private and security conscious healthcare meetings. The ARTISAN GRILL is the hotels smaller restaurant and accommodates just 46 persons. Bar: The hotel’s Lounge Bar and patio area is located off the main lobby on the first floor and provides casual sofas and low tables for a coffee bar atmosphere, alongside traditional seating and stools for guests that wish to order bar snacks. The bar is used as a service station for the Aroma Restaurant and its décor and ambience is relatively low key but should not form any part of any healthcare meeting programme. 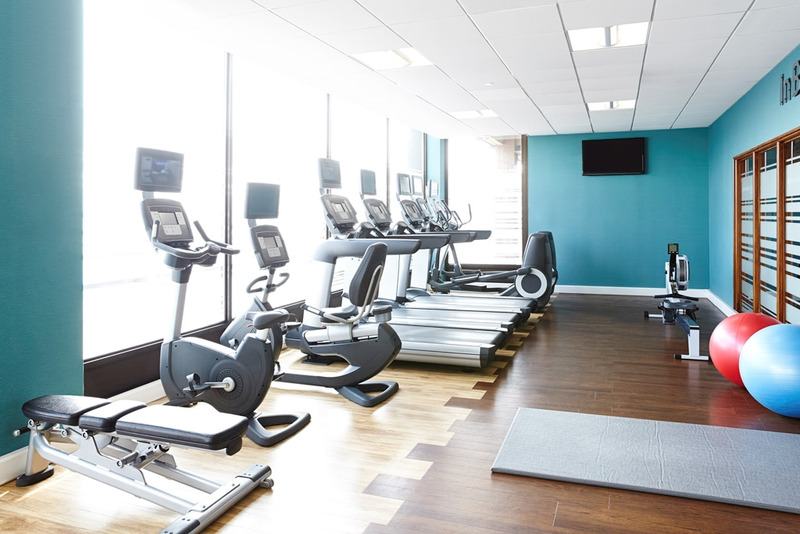 Leisure: The In Balance fitness area located on the first floor is available to guests only and offers free weights and fitness machines. There are no pool or spa facilities. 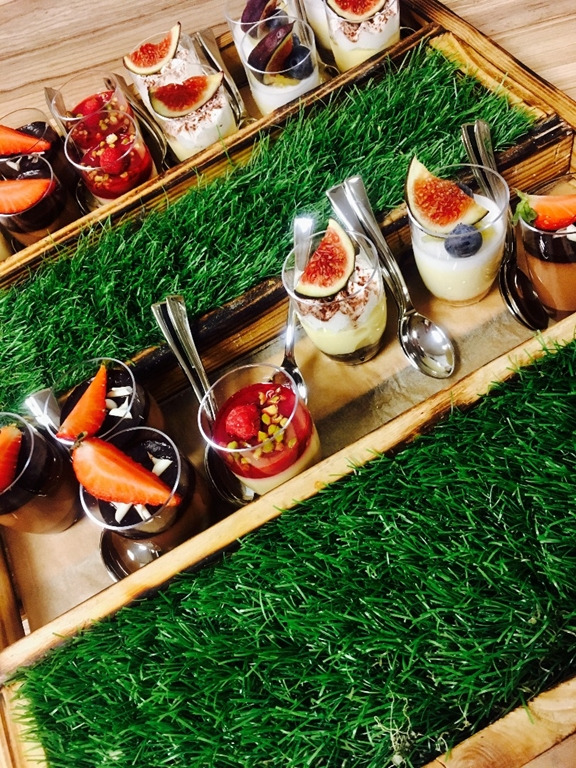 The service levels are consistent with a venue suitable for healthcare meetings and events. There is no sign that the venue attempts to use service and a guest to staff ratio to leverage luxury impressions. As in most international hotels, Wi-Fi is complimentary but for a more secure access during meetings, a dedicated line is recommended. The Accor group is actively involved in the Planet 21 scheme which provides a platform for sharing knowledge about sustainable development in the hotel industry. The Accor Hotels Le Club membership programme offers meetings and professionals rewards per booking could lead to complimentary hotel stays and upgrades for the booker. This type of programme is like other hotel brand reward schemes and can be opted out of based on a company’s policy on booking procedures. Our Group's number one priority, expressed in our value of Guest Passion, is to satisfy our guests and to bring the Feel Welcome promise, our Group signature, to life. We believe that guests must be fully involved in our work in order to effectively and sustainably act in favour of humanity and the environment. These studies also allow us to understand their visions and expectations. The tick shown below identifies the rate banding applicable for that venue, based on its geographical location. Please note these rates act only as a benchmark guideline. Actual rates will be subject to seasonal fluctuations, corporate agreements and any individual/separate negotiation.